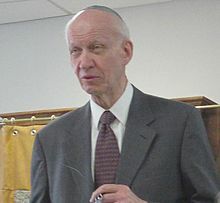 Irving Greenberg (born 1933), also known as Yitz Greenberg, is a Modern Orthodox rabbi Jewish-American scholar and author. He is known as a strong supporter of Israel and a promoter of greater understanding between Judaism and Christianity. I don't care what denomination you belong to, as long as you're embarrassed by it. As quoted by Baruch Sienna in a 2006 review of Nothing Sacred : The Truth about Judaism (2003) by Douglas Rushkoff, and in "Across The Great Divide" by Jonathan Mark in The Jewish Week (3 September 2008). This page was last edited on 28 September 2017, at 15:28.